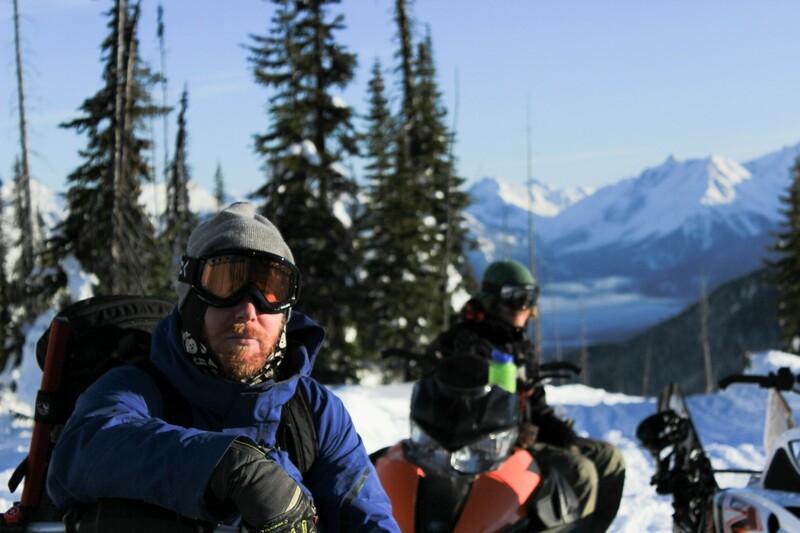 Living in Golden gives me pretty easy access to a lot of different sledding areas in; deep tree riding and wide open alpine riding is available in the neighbouring towns, however, why would I leave when I can get all that here? I always talk about getting out and exploring new towns and new ranges to the north and closer to the coast, but when it’s good, why go anywhere else? Golden is good. Real good, and real good often. Quartz creek is the best access in early season because of the high elevation, it offers parking and unloading into snow right off the Trans Canada, and if all you are looking for is a logging road to stretch the legs on, Quartz is your zone. If you are feeling a little sporty, it isn’t that much more of a push to go a little further past the end of the road and get up to the; there are only a couple spots to cross the creek and minimal rocks and stumps. Once there is a meter or so on the ground, it is possible to push past the cabin into the alpine up towards old cabin valley. Thanks to SledGolden there are some new signs up there giving directions to some of the popular areas that are on the trail map, please inform yourself of all national park boundaries and other closures outlined on the map. The cabin may have some leftover firewood from the previous season to fire up the stove and warm up and dry off before the ride out, but until SledGolden begins operations for the season, don’t count on any maintenance or firewood. Visit www.sledgolden.com for grooming schedules. @b_dickson is in there somewhere. Gorman Lake is not advised as an early season sled destination because of all the large boulders and open water (the lake itself and creeks). The access is a little low to get enough early season snow in the trees down below the lake, it’s best to stay away from Gorman until grooming starts. Silent pass is the last of the three managed areas in Golden and can be a pleasant surprise in early season; the rolling alpine meadows are fairly obstacle free and open; however, there is a lake up there and a few streams to be wary of as they won’t freeze with the blanket of early season powder. Breaking trail up to the alpine could prove to be a challenge in the early season, pushing up past treeline through the stumps and deadfall with less than a meter of baseless snow is not only hard on tracks and A-arms, but hard on the brain. If you have the drive to be the first ones of the season to push up past the end of the road into Silent Pass, not only will you be rewarded with fresh untouched powder but you’ll have some pretty hefty bragging rights too. So if its easy access to the first snow of the season I am looking for, Quartz Creek can satisfy that urge, and if I want to push it and go on an early season adventure, I head for Silent Pass, but I definitely wait on Gorman, usually until grooming starts. Even though it is still early, avalanches are still a hazard, so be sure to check avalanche and weather forecasts before heading out.